It has been an extremely busy week. I've been working on getting ready for the photo shoot for the Spring issue at the same time I'm working on the Summer issue. We've selected the designs we are going to use and now I'm contacting yarn companies for the designs. This is my least favorite part of the process. Some companies are great, Shibui, Classic Elite, Cascade to name a few, while others are not so great. I have to get the yarn to the designers ASAP as we are trying to get back on our old production schedule. It has been slow this week. I'd had a few lessons and a couple of emails but that is it. My students are my top priority. Their lessons always come first. Maybe they are reading my mind & letting me get all of this work done! I've done a posting on horizontal buttonholes which was also the topic of my LAST Finishing With Confidence article. There are quite a few ways to work this type of buttonhole. Some of the instructions I've seen have run to pages and are extremely complicated. This one is somewhere in the middle but produces a nice result. 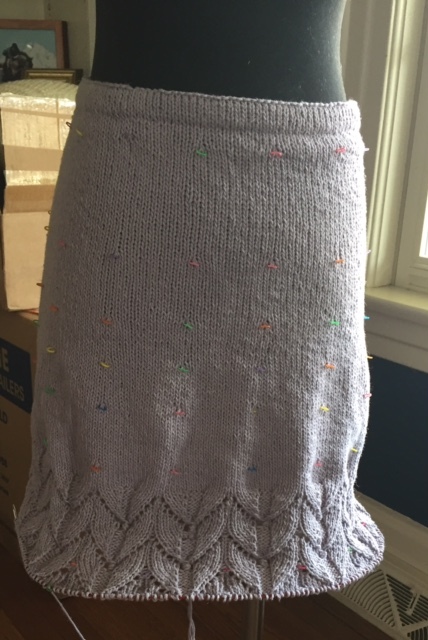 The one below is worked in stockinette. 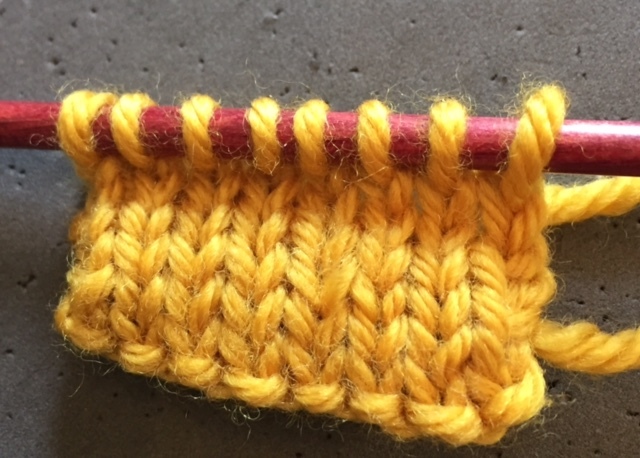 The basic steps for all version of this type of buttonhole requires that you bind off the stitches for the opening using the slip stitch bind off which doesn't use the working yarn. One the stitches are bound off you use the cable cast on to cast on the same number of stitches. There are a few extra steps along the way. Work to the position for the buttonhole. 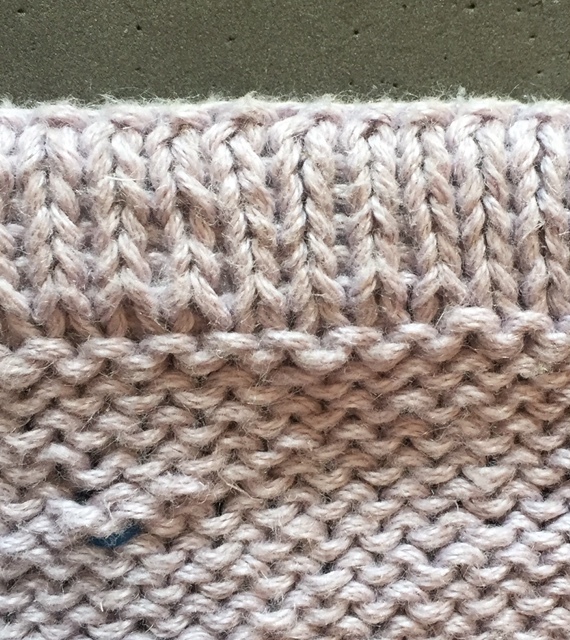 • Bring yarn forward and slip the first stitch on the left needle purlwise. • Bring the yarn to the back. • Slip the next stitch on the left needle purlwise to the right needle. 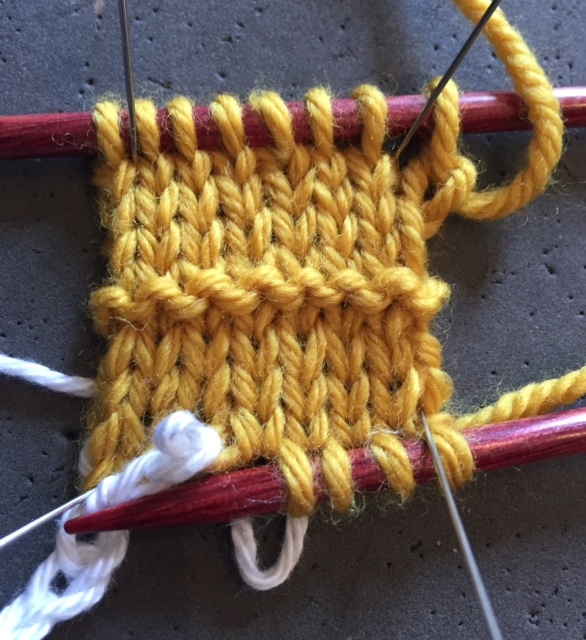 • Pass the first slipped stitch on the right needle over the second stitch (as if to bind off). • Repeat Steps 4 and 5 until the buttonhole is the desired size. • Slip the last bound-off stitch to the left needle. 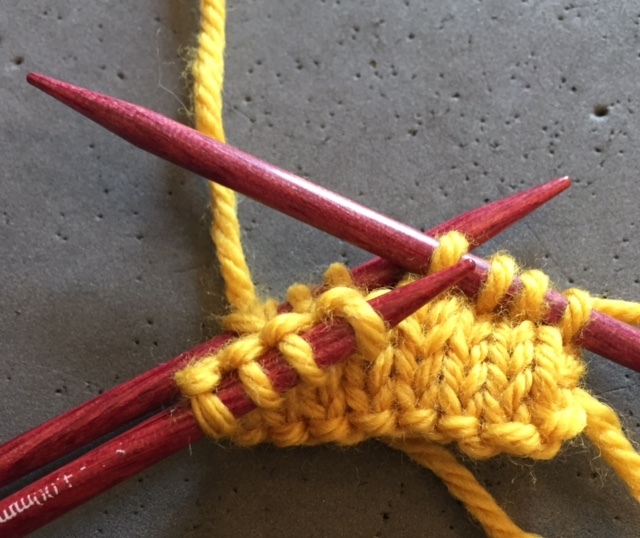 • Turn the work and use the cable cast on technique (inserting the needle as if to purl rather than as if to knit) to cast on one more stitch than you bound off. • Slip the first stitch on the left needle to the right needle and pass the extra cast on stitch over the slipped stitch. 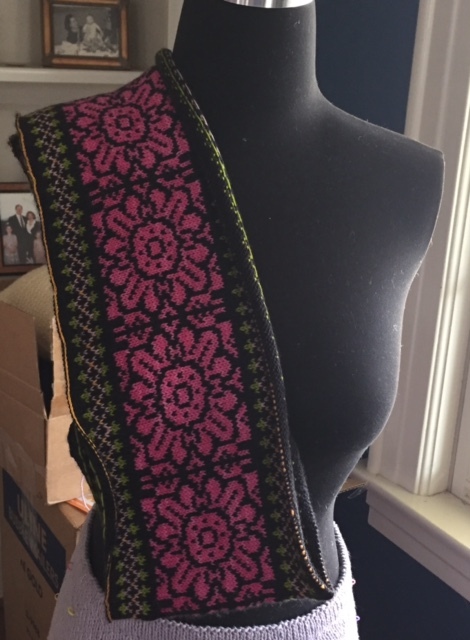 • Work the next stitch in the established pattern. Is all of this worth it? Yes, if you need a larger buttonhole or a very strong buttonhole. I don't use this for every project and I do have to look up the instructions every time so I don't miss a step. I use the purl version of the cable cast on so that the top half of the buttonhole matches but this isn't necessary. Salon will be on Sunday a bit later than usual. The photo shoot is Sunday morning. Tomorrow afternoon I'll be at the Met Simulcast of Traviata which has a special meaning for me. It was the first opera I saw and will always be a favorite. I finished up the orange sweater. The arms on my mannequin are so skinny it makes the sleeves look huge! Next I finished the hat for the article on jogless joins. I think it is pretty cute. I decided to make a double knit buff for Stephanie's birthday. I started it several times. I first used the invisible cast on for double knitting. There were two problems with this. First I was casting on over 100 stitches and if you've ever used this cast on, you know it is a pain with only 20 stitches or so. Then this was worked in the round. I finally gave up and wound up using Judy's Magic Cast On for the first row. It worked pretty well. I wanted to get it to Stephanie before this weekend as it is supposed to get cold. Here are photos of both sides. And here is the reverse. I'm now working on a cowl for Baah yarns. There is nothing to show but I should get a lot done while I'm waiting for the Hanako from Classic Elite to arrive. I'm making a skirt & top.